Life is pretty chilled in Spain, it’s all siestas and everything runs late. The Spanish like to enjoy themselves, move slow, eat well and relax. Spain is pretty cheap when compared to other places in Europe. You’ll find free wi-fi almost everywhere. Prices are are lower outside the major cities, I’ve used airbnb with great success. Hostels usually offer a free breakfast starting from €15, hotels start around €45. Tip: Get £30 off your first Airbnb trip of £55 or more click here. Tapas will be the cheapest meal you can get, if you want wine expect to pay the same again or more. The average restaurant will cost around €20. You have the usual Fast food restaurants like McDonald’s. Tip: Spaniards don’t waste food. It is better to decline food rather than leave it on your plate. Hire car is the best method of transport if you want to go any distance, try Rhinocarhire.com. If your staying in a city then use the metro and bus lines. Trains can be expensive especially the high speed routes. Spaniards tend to be aggressive drivers – expect honking, swearing and vigorous gesticulating in the course of a day’s drive. Your best bet is to keep calm and carry on; the last thing you want during your holiday is an accident on the road. Tip: Spaniards speak a lot with their hands. Never mimic them. 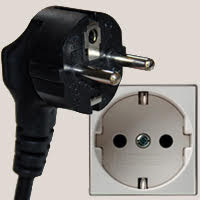 In Spain the power sockets are of type F. The standard voltage is 230 V and the standard frequency is 50 Hz. Type F: This socket also works with plug C and E.
‘Free’ roaming in the EU has now started, failing that there’s another easy trick to get free roaming simply by swapping your Sim. (You’ll need an unlock phone though) Otherwise, it may be best to stick to free Wi-Fi. Spaniards don’t waste food. It is better to decline food rather than leave it on your plate. Expect to be interrupted when speaking. Be patient. Nothing is done in a hurry. Spanish trademarks are procrastination and delay. If you have the time and want to save money, take the bus. You’ll find the cheapest (and freshest!) produce and meat at the local markets. Spain is a country where the strength of the sun can be deceiving, so bring lots of sunscreen. Get £30 off your first Airbnb trip of £55 or more click here. Have you been to Spain? What’s your favourite place and time of year to visit?